"This is a recipe I created for my vegetarian sister-in-law after she ran the Marine Corp Marathon in Washington, DC. I was not able to be there to cheer her on so I sent this dish. It is actually better the next day but I have never been able to keep my family out of it once they smell the aroma!" 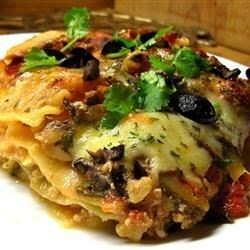 Cook lasagna noodles in a large pot of lightly salted, boiling water for 10 minutes, or until al dente. Rinse with cool water, drain, and set aside. Heat oil in a large skillet over medium heat. Cook the chopped onions, mushrooms, garlic, and zucchini in the oil until soft. Stir in both cans of crushed tomatoes, tomato paste, oregano, brown sugar, and salt to taste. Reduce heat to low, and simmer for 15 minutes. Meanwhile, microwave frozen spinach until cooked. Cool, and then squeeze out excess water. Drain cottage cheese. Using a mixer, blend spinach, cottage cheese, eggs, and 2 tablespoons basil until smooth. In a separate bowl, combine shredded mozzarella cheese and grated Parmesan cheese. Preheat oven to 350 degrees F (175 degrees C). Spread 1 cup sauce in the bottom of a 9x13 inch baking dish. Layer 1/3 of the noodles, 1/3 cottage cheese/spinach mixture, 1/3 of remaining sauce, and 1/3 cheese mixture. Repeat layers with remaining ingredients. Sprinkle top with remaining 1 tablespoon of dried basil. Bake in preheated oven for 60 minutes. Let stand for 10 minutes before serving. Leave out the pasta and lighten up!